Ludwig “Victorious” Drumset. 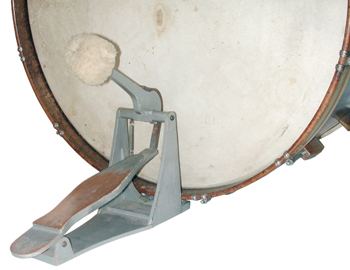 Note the various wooden components such as the lug casings, snare strainer, bass drum pedalThe pedal used to play the bass drum on a drum set. , bass drumThe lowest pitched drum in a marching band or with a drum set. A two-headed drum, it is usually... muffler, bass drumA hollow cylindrical shell of any size that has a head stretched over one or both ends and is b... spurs and the mounts for the toms, cymbalA copper/bronze (or variation of metal alloy) disk struck with a drumstick or crashed together ..., cowbellA metal instrument used in latin and rock music, usually to lay the rhythmic foundation for the..., and woodblock. During the Second World War, restrictions were placed on the manufacture of musical instruments and other objects considered non-essential to the war effort in the United States. The metal components in these objects could constitute no more than 10% of the total weight, and the use of copper was restricted. 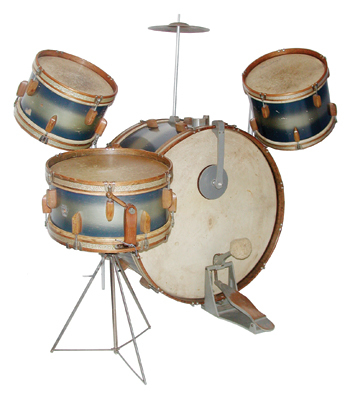 In addition to a reversion to rope-tensioned drums (see the WFL Rope-Tensioned field drum in Percussive Notes, October 2008), the WFL Drum Company also manufactured an entire drumset, the “Victorious” model, which was tuned with tension rods and lugsThe tension rods (or screws) that hold the hoop and drumhead onto the drum.. 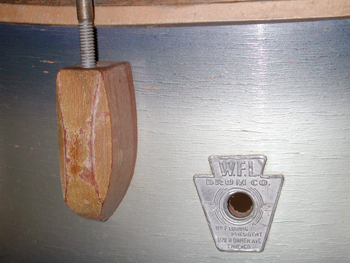 This early design utilized stamped, metal claw hooks threaded into a fixed metal nut mounted within the hollow wooden lugs to tune the heads. Several hundred of the sets were manufactured before the claw-hook tuning system was abandoned in favor of an internal tuning system with fixed counterhoops designed by Cecil Strupe. The shells were three-plies—a cross-layer of poplar between two of African mahogany—which were reinforced inside with two maple rings. The counterhoops were constructed of maple with a decorative insert. All wooden components of the snare, including the strainer, were made of maple. This set consists of a 14 x 26 bass drum, a 6 x 14 snare drumOne of the more common drums in marching bands and drumlines and the primary drum of a drum set..., 8 x 11 and 9 x 13 toms, and a 10-inch Zilco cymbal. The drums, fitted with calfskin heads, are finished in the popular blue and silver “Lacquer Multi-Color Finish” with maple hoops inlaid with WFL’s “Silver Flash Pearl” covering. The bass drum pedal and muffler are both made of solid maple, as are the mounts and posts for the toms and cymbal. 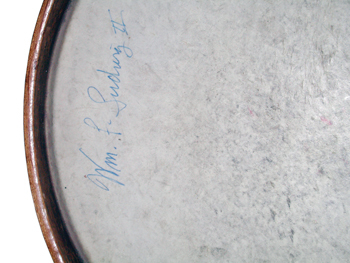 The signature of “William F. Ludwig II” appears on the head of the larger tom, and a WFL “keystone” badge made of aluminum is attached to the snare drum with adhesive instead of a rivet. A complete “Victorious” drumset was usually sold with a floor tomGenerally the deepest tom on a standard drum set. It sits upright on 3 legs., a wooden stand for the snare drum, a wooden hi-hatA piece of the drum set, consisting of two cymbals mounted on a stand. The cymbals are opened a... stand with cymbals, and a woodblock and cowbell mounted on the bass drum. 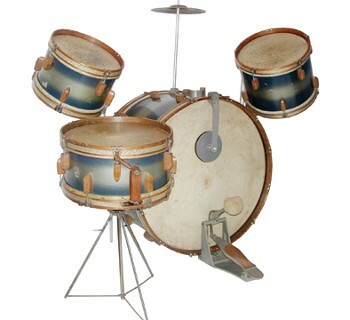 Some early versions of this set also had goatskin heads tacked on the bottom of the toms in lieu of hoop-mounted heads.